Willie J. Tate grew up and lived in the state of Alabama until he joined the Army in 1970. His career with the Army afforded him the opportunity to reside in places such as Germany and Korea. Willie Tate retired First Sergeant (E8) United States Army, after 24 years of service, and now presides in Killeen, Texas. - Raised in Brent Fox Lodge # 18 - Jurisdiction of Kentucky – 1980. - Advanced to Subline Prince Consistory, Keystone # 85, Seoul Korea, and Northern Jurisdiction – July 1980. - Created a Noble in Obelisk Temple # 187, Seoul Korea - July 1980. - Demitted into Jno G. Lewis 622 Lodge of Copperas Cove, Texas – 1981. - Chartered member of Mount Sinai Chapter # 42 Holy Royal Arch Mason of Copperas Cove, Texas. - Chartered member of South Central Commandery # 37, Knights Templar of Killeen, Texas. - Initiated into The Order of the Eastern Star, Blanche M. Bruner Chapter # 17, Wiesbaden Germany, and Oklahoma Jurisdiction - January 1987. - Demitted into Far West Chapter # 482, Copperas Cove, Texas - June 1990. - Joined E. L. Downing Court # 237 Heroines of Jericho - Killeen, Texas. - After Permanent change in station (PCS) to Germany, demitted in to Right Step lodge # 636 Heidelberg, Germany (Texas Jurisdiction) in 1995. - Returned to Texas and demitted in Jno G. Lewis Lodge #622, Copperas Cove, Texas – 1998. - Elevated to Grand Inspector General of the 33o in Memphis, Tennessee on October 9, 2010 (Southern Jurisdiction - Memphis, Tennessee). - Demitted from Marshal Gilkie Council # 12 in Pine Bluff Arkansas, to Texas Royal Select Mason in 2018, Central Texas Council # 5 - Killeen, Texas. 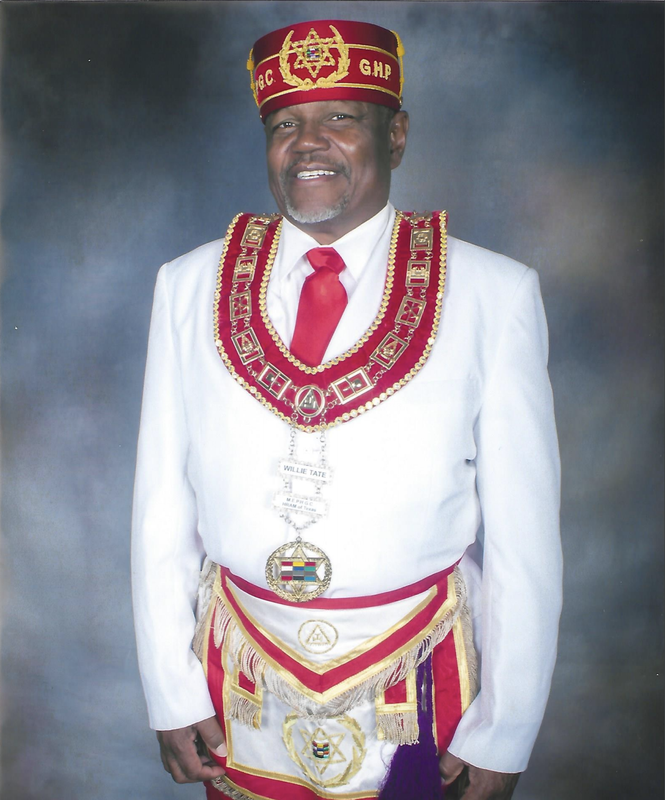 Willie J. Tate is currently a Past Master, Past High Priest, Past Thrice Illustrious Master, Past Eminent Commander, Past Patron, Past Joshua and Honorary Past Potentate. He is an active member of the following: Jno G. Lewis lodge # 622, Devin Glory OES Chapter # 3 and Mt. Saini Chapter # 42 HRAM, of Copperas Cove, Texas. South Central Commandery # 37, Central Texas Council # 5 RSM, Central Texas Consistory # 306, Nubia Temple # 191, E.L. Downing HOJ # 237 of Killeen, Texas. Currently, Companion Tate holds the position of the Most Excellent Grand High Priest of the Most Excellent Prince Hall Grand Chapter Holy Royal Arch Masons of the State of Texas.